Different from other ordinary car vacuum which need extra cord to power it, our vacuum can be charged and used in everywhere. Do not need to find a socket or tidy the cord or drag the big vacuum machine around, our vacuum is light weighted and cordless. Very easy to use. Support dry and wet use. Can quickly absorb the spilled liquid inside the car (except corrosive, flammable and explosive liquid). Get rid of all annoying rubbish in your car including liquid, debris, pet hair even they fall into hard-to-reach area. Even with super power Motor, 4000PA above Cyclonic suction, the vacuum is quieter (below 85db). Three serviceable attachments - brush suction nozzle, extra soft tube and flat suction nozzle which can help you to clean hard-to-reach places with no trouble. Built-in LED light, a great helper for dark places cleaning and night cleaning. Removable, washable and reusable HEPA filter. Do not touch the metal portion of the plug after use the car vacuum. It is advised that use the car vacuum for no more than 15 minutes at a time. CORDLESS & RECHARGEABLE: Our vacuum cleaner can be recharged, avoiding the hassle of a cord. The cordless design makes it no space limited, you can take it to clean any corner of your CAR and HOUSE. CYCLONIC SUCTION & QUIETER SYSTEM: Our vacuum cleaner with 120W super power Motor, 4000PA above Cyclonic suction, it can clean dust, pet hair, crumbs, wool fabric, food debris, paper scrap, cigarette ash, leaves and other small things in the car. The system of our vacuum is quieter (below 85db). 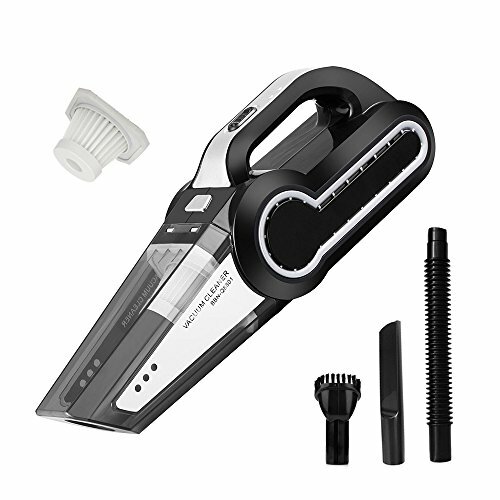 MULTIFUNCTION & LED: Our vacuum cleaner comes with 3 serviceable attachments - brush suction nozzle, extra soft tube and flat suction nozzle which can help you to clean hard-to-reach places with no trouble. Also a built-in LED light, a great helper for dark places cleaning and night cleaning. WASHABLE HEPA FILTER: The HEPA filter in vacuum is removable, washable and reusable which can be taken out of and can be washed with water. GREAT CUSTOMER SERVICE: With international safety certification FC, CE, ROHS. If you have any problems, please feel free to email us, we will try our best to help you within 24 hours. All Dr.Auto products are guaranteed to REFUND or REPLACEMENT if you are not satisfied with the product within a year! If you have any questions about this product by Dr.Auto, contact us by completing and submitting the form below. If you are looking for a specif part number, please include it with your message.